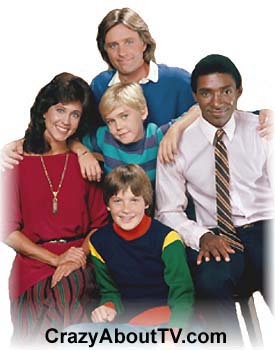 Silver Spoons was a 30 minute, family comedy series on NBC about a 30-something millionaire (Edward Stratton III) who found out one day that his former wife (of only 7 days) had conceived a son (Ricky Stratton) and not bothered to tell him! Dad was into video games, pinball machines, model trains, and just about anything else that someone Ricky's age is into. The problem is that 12-year-old Ricky wasn't into any of those things, in fact, he thought they were silly and childish. The main theme of the series was about dad teaching son how to enjoy being a little boy and son teaching dad how to be a bit more mature and responsible. The other key character was "Kate Summers", Edward's secretary, who was secretly attracted to him. The audience knew it but, unfortunately for Kate, Edward was far too immature to figure it out and Kate was too shy to come right out and tell him. Edward's dad would also drop by occasionally, mostly to let Edward know how disappointed he was with his childish lifestyle. Silver Spoons began with Edward losing his entire fortune to his crooked business manager. Luckily, Ricky discovers the crime and gets the money back for his newfound dad! Ricky was brought up by his mother after she and his father disolved their seven day marriage. Ricky's mom never told him about his father until she sent him away because she felt he would just get in the way of her relationship with her new husband. (Poor kid!) At first, dad couldn't imagine raising a 12-year-old that he didn't even know so he sent him off to military boarding school. After thinking it over, however, Edward realized that his son needed a loving parent and a little love wouldn't hurt him either so he brought Ricky home to his mansion. Silver Spoons had no trouble attracting the most popular celebrities at the time to be guest stars and recurring stars on the show! Some of them included Mr. T ("The A Team"), Jason Bateman ("Arrested Development"), Gary Coleman ("Diff'rent Strokes"), John Houseman ("The Paper Chase"), Joey Lawrence ("Blossom"), Matthew Perry ("Friends"), Sharon Stone ("Basic Instinct"/ "Casino"), and Ray Walston ("My Favorite Martian"). Part of Edward's fortune was due to his ownership of an international toy company. It was a perfect fit for Edward's juvenile personality. His mansion was absolutely full of toys including a freight train that ran through the whole mansion! Shortly after Silver Spoons premiered, adorable, 12-year-old Ricky Schroeder (now "Rick") became and instant "almost" teenage idol! His photo dominated the cover of teen magazines for several years. His fans were so loyal that many continue to religiously follow his career to this day on shows like, "NYPD Blue" and "24"! Rick's later career would center more on drama than comedy as he never really felt kosher doing comedy. He once stated, "I was never really comfortable doing comedy. Though it was good the first couple of years, there were problems, and it became a stifling experience. I was happy it ended". Rick's career got its first big boost when, in 1980, he won the Golden Globe Award in the "New Star of the Year in a Motion Picture - Male" for his role in the film, "The Champ". He was also nominated in 1980 for a "Young Artist Award" for "The Champ". Many more "Young Artist Award" nominations and wins would come Rick's way over the next several years. Nominations in 1981 for the film, "The Last Flight of Noah's Ark" and in 1983 for the TV movie, "Little Lord Fauntleroy". In 1982 he won for the film, "The Earthling" and in both 1983 and 1984, he also won for "Silver Spoons". Then Rick had a few years where he he had trouble shaking off his image as the little boy on Silver Spoons, but five years later in 1989, he was finally recognized again with another "Young Artist Award" nomination for his role in the TV movie, "Too Young the Hero". Since then, Rick has been recognized by many other Award wins and nominations inclucing another Golden Globe nomination in 1991 for the TV movie, "The Stranger Within". Erin Gray was one of the first fashion models to make the change to a highly successful TV career. Before her role on Silver Spoons, Erin played "Colonel Wilma Deering" on the series, "Buck Rogers in the 25th Century". Her beauty attracted men to the series (as they would also on Silver Spoons) and women liked her character on "Buck Rogers" as she had a "take charge" attitude as strong as any man, yet still be gushing with feminine charms. Erin appeared as a guest star on far too many other TV series to mention here during the 1980s and 90s and she's appeared in many movies in the 2000s. Star Trek fans might be interested to know that she was one of the finalists being considered for the role of "Captain Janeway" on "Star Trek: Voyager". In addition to Silver Spoons, Joel Higgins also had starring roles on "Best of the West" (until the season right before Silver Spoons began) and "Salvage 1". He also appeared on the soap opera "Search for Tomorrow" from 1975-1978. Joel also had a "second job" as a jingles writer. He wrote ones for TV commercials including "Kool-Aid" and "M&Ms". He even wrote the theme song for "Life With Lucy", Lucille Ball's final series. As a "third job" Joel also performed as a singer in musical theatrical shows including the Broadway revival of, "Oklahoma" and "Shenandoah" (which won him a "Theatre World Award"). After two and a half years of hoping, fans finally had their wishes come true when Joel and Kate finally tied the knot! In episode #60, "Marry Me, Marry Me - Part 1", Kate gets a fantastic job offer in another city that would require her to leave the Stratton household. That inspires Joel to (at last) "pop the question", but Kate's not sure about what she should do. In episode #61, Ricky and Joel convince Kate that forming a family with the two lovable guys is more important than the job and it's Wedding Bells at last! Performed By: "Bob Wirth" and "Rick Howard"
Thank you for visiting our Silver Spoons page!